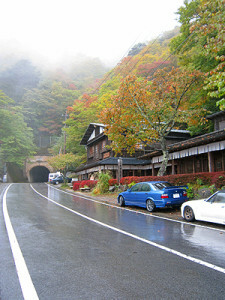 Coming from Lake Kawaguchi side on Yamanashi Prefectural Road 706 towards ‘Misaka-toge Pass‘, just by the entrance of old ‘Misaka-toge Tunnel’, you will find an old two-story built Japanese lodge. 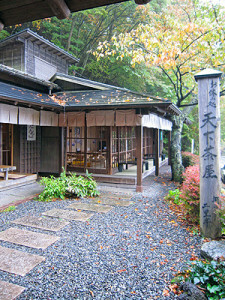 This is Tenkachaya, a tea-house which started in 1934, where beverages and food were served for people travelling. 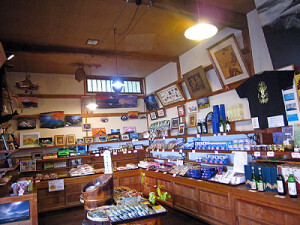 The place has become famous through a famous Japanese author of prewar period, Masuji IbuseW, later carried on to one of the popular author even today, Osamu DazaiW. 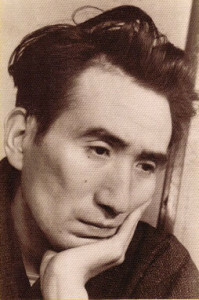 Osamu Dazai stayed in Tenkachaya for 3 months in 1938 who was lead to the place by Masuji Ibuse who also stayed at that time, started to write a short story, ‘Fugaku Hyakkei (meaning 100 scenes of Mt. Fuji)’. His lines on Mt. Fuji is one of the marvelous expressions, unlike those written by the past artists, nihilistic but honest thoughts towards the mountain. “The view is absolutely as ordered. 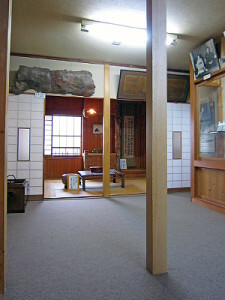 The room where he stayed is now a reference room consisting some materials concerning his works in Yamanashi. 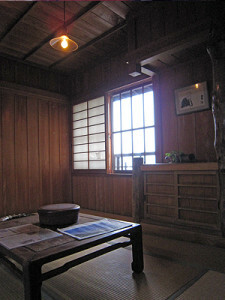 You can go up stairs, to his room freely and enjoy the view from an old window of Mt. Fuji like Osamu Dazai did. 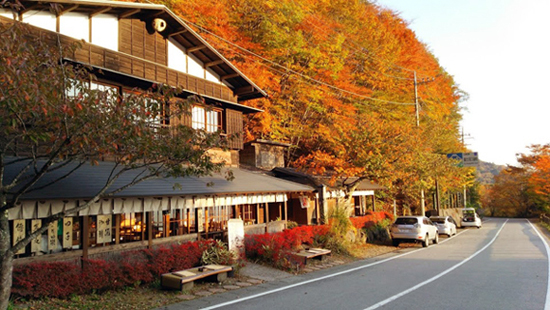 On the ground floor, there are tatamiW room tables as well as normal tables for you to enjoy your Yamanashi traditional dishes as ‘Houtou’ (flat noodles in Miso soup full of vegetables) and other delicacies of the mountain. The recommendation is a cup of ‘AmazakeW ‘(Sweet Sake), which is a hot non-alcoholic sweet drink made from fermented rice which has been one of the favorites of travelers 80 years ago. 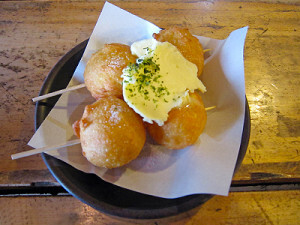 ‘Imo-dango’ (dumpling of potatoes) is recommended for those who want to eat a bit more. They are deep fried mashed potatoes in rolled up in balls, coming in two, skewered and served with butter. This is amazingly delicious and we strongly advise you to try. They also have a range of souvenirs that only come from this area. Some, very wild! The best way to get here is to have your own car with you but if you don’t, there is a bus coming up. Still, there aren’t many busses, only a few in the morning. We have posted up a timetable below of the bus but the time varies according to the year, season and weather so please confirm with Fujikyu Yamanashi Bus beforehand with more reliable information. A great view from Tenka-chaya toward Mt. 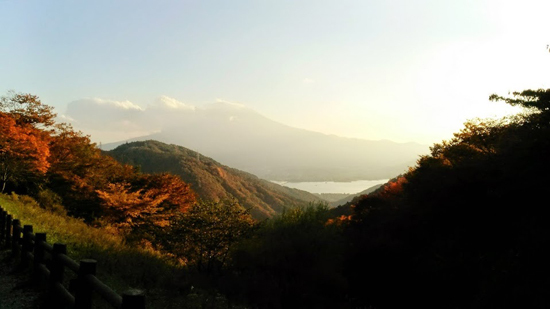 Fuji in autum, which also Dazai might have seen. 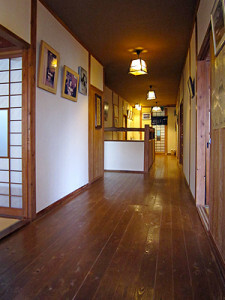 Address : 2739 Kawaguchi, Fuji-Kawaguchiko-cho, Minami-tsuru-gun, YAMANASHI Pref.